Since its humble inception over one hundred years ago, Hutto Discovery United Methodist Church (HDUMC) has brought together groups of people who may have differed over specifics, but were united in their love of God and their passion for sharing his message of redemption and overwhelming love. The church began as the Swedish Methodist Church in the 1800s. The small group of immigrant families held services entirely in Swedish in the church they built in 1882. They began making plans for their new church building – the chapel still in use today – in 1901 with the purchase of several lots and the construction of a parsonage. In 1910, the new church was completed. As future generations of the Swedish Methodist Church began to assimilate, so did their services and activities. This shift toward a more universal church was evident in 1938 when the Reverend and elders of the Swedish Methodist Church invited the Hutto American M.E. Church South to join with them. Focusing on their common bonds, the two churches merged as the Hutto Methodist Church and held their first service on the first Sunday of November 1938. The church grew and thrived for the next three decades. In 1968, the General Board of the Methodist Church recommended another merger. The church became Hutto United Methodist Church when it joined with the United Brethren Church, extending the reach of God’s love in the community once again. In 1997, the Church Growth and Development Commission of the United Methodist Church recognized the potential growth of Hutto and the new opportunities for outreach and ministry that came with it. Hutto United Methodist Church was the faith seed for the new church, with a new identity and message. Hutto Discovery United Methodist Church evolved over the following years of change and growth. 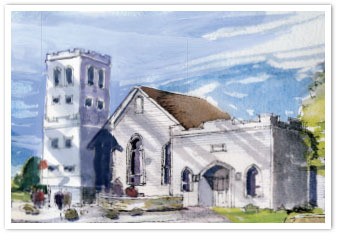 In 2004, with 10 acres donated by the Hanson family, HDUMC began planning for their new home: a whole church campus that included moving and rehabilitating the 1910 sanctuary. HDUMC held it’s first service in the beautifully renovated and restored sanctuary on its new site on March 16, 2008. Today, HDUMC serves as a vibrant and youthful church home in one of the fastest growing communities in the nation. Our deep and historic roots give the church the solid foundation it needs to adapt and serve the many generations to come. 1901 – The Swedish Methodist Church buys two lots from Ed Eklund for $300. 1902 – The parsonage is built on one lot in 1902 for $800. 1908 – Two more adjoining lots are purchased in 1908 for a cost of $100. 1910 – The new church is completed in November at a cost of $10,000. Mr. O. Anderson of Austin was the architect and Mr. Fred Lundell was contractor. 1911 – With the arrival of pews, the new church is finally dedicated on May 28, 1911. 1938 – On September 23rd, Ed Eklund, Dolf Gustafson, and Charles E. Johnson authorize Reverend Edwin Shalen to invite the American Methodist Church to unite with them. Reverend Howard Knox and the Hutto American M.E. Church South accepted and appointed a working committee consisting of H.E. Gainer, F.J. Young, H.W. Sands, Mrs. V.C. Hutto, and Mrs. Virgil Apllin to work out the details with a committee from the Swedish Church, consisting of Paul Nelson, Charles E. Johnson, Mrs. B.N. Dowing, Mrs. Oscar Olander, and Ed Eklund. 1938 – Hutto Methodist Church holds its first united service on the first Sunday in November. 1968 – Hutto Methodist Church merges with the United Brethren Church to become Hutto United Methodist Church. Spring 2004 – The Hanson Family pledges a 10-acre land gift for the new church campus (deed signed September 2, 2004). May 23, 2004 – Land Dedication Ceremony held at the new site. June 27, 2004 –First meeting of Building Committee: Chair, Jeff Ripley, Mike Adams, Aleda Crislip, Dennis Kleppe, Doug Peterson, Becky Reid, Bonnie Sells, Wayne Yoas, Pastor Kathye Schade. October 31, 2004 – The building committee and congregation hold a Master Plan workshop. May 2005 – A Sacred Past, A Glorious Future Capital Fund Campaign received pledges of $407,480. September 11, 2005 – Church Conference approves resolution for Phase 1. Easter, April 16, 2006 – Last worship service is held in the sanctuary at 605 East Street. March 16, 2008 – First worship service in sanctuary at 350 Ed Schmidt Blvd.